As the Pacific spreading pushes the Central American plates forward to form the Tharsis shield volcanoes, the Himalayan mountain range is simultaneously pushed forward from the other side and, as it collapses into new volcanism, it comes to rest closer to the volcanoes. 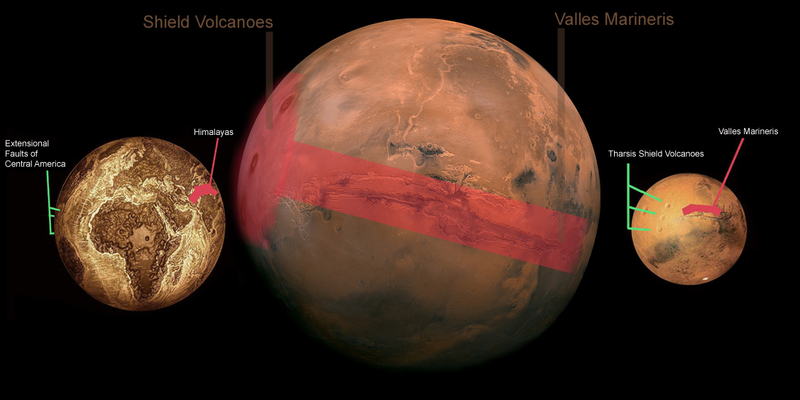 Its remnant volcanism pulls open Valles Marineris, the large tear that corresponds to the scar of the original impact. NOTE: By this stage the oceans and most of the atmosphere are gone. This process is partly related to climate change. The effect of the water activity of Mars plays a large part in the reshaping of this topography. Both are covered in 'Global Warming'.